How’s your neck feel? How about the top of your shoulders? Do you have a tightness between your shoulder blades? Well it turns out your not alone. In the last couple of years I’ve had several of the executives I train complain of these symptoms. Even to the point of seeking out medical advice. I only bring up that they’re executives because this is one of a few things that these people have in common. They sit at a desk in front of a computer. Other common traits are that they are in high stress occupations. And another is that they workout every chance that they can (very frequently). You would think that the latter would be their saving grace. When it comes to weight training balance is what you want to strive for. You see the one body part you don’t want to forget about is your BACK. The reason that a lot of people who do resistance training suffer with upper back problems is that they forget to include back exercises. The tone and muscle that is made, especially with chest moves pulls your shoulders in and forward. Combine this with sitting at a desk and not taking the time to consider correct posture and you’ve got the formula for a tight neck and shoulders…..OF COURSE!!! But take time to strengthen your back and you can counteract this. In a previous post I listed chest and back as the 2 upper body parts to always train. But you must include your back both upper and lower. Lowers should be trained with your ab moves to make it a complete core workout. 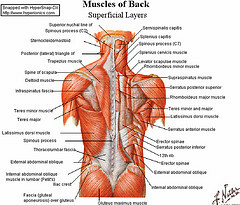 And upper back is just as important due to its connection with your posture. Back exercises include dumbbell rows, lat pulldowns and pullovers and the list goes on and on. There are plenty of movements to perform so that you can counter the effect your other upper body training is doing to your posture.